Vegetarian Cookster: Vegan French Toast, "Chicken" Nugget Salad and Pesto Soup, oh my! Vegan French Toast, "Chicken" Nugget Salad and Pesto Soup, oh my! This is a rarity in that I usually don't post all three meals that I make in one day... but a lazy Sunday will do that to you. Actually, the day wasn't all that lazy... hubby and I went to see Wicked the musical, which was just wonderful! We started off the day with a vegweb.com recipe for vegan french toast. 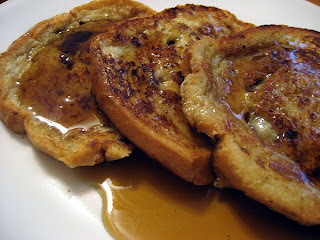 My omni hubby loves this recipe... says it's the best french toast he's ever tasted. I'll post the recipe below because I couldn't find it on vegweb, even though I know that's where I got it. 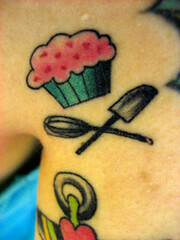 I love vegweb... when I don't have my nose in a cookbook, I'm browsing recipes on vegweb. Lots of great recipe finds there! Give it a visit! 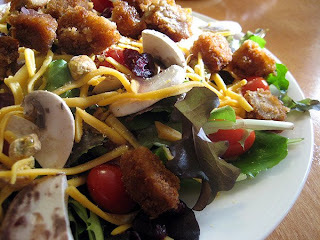 Lunch was a quickie... just salads with greens, cherry tomatoes, mushrooms, shelled pistachio nuts, dried cranberries, veggie cheese and leftover/reheated "chicken" nuggets chopped up... all that topped with Newman's Own Lighten Up Raspberry and Walnut dressing. Mix together the flour, milk, sugar and cinnamon to form a batter. Dip bread and fry in a lightly greased pan until golden brown. The original recipe suggested sprinkling with vegan powdered sugar, but I never have. We top it with pure maple syrup instead! Ooh, everything sounds GOOD! Now I want french toast! 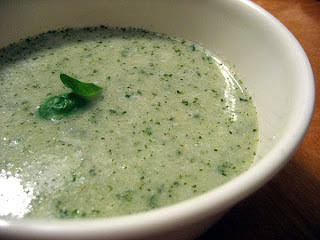 wow, pesto soup! i'll have to try that. looks yummy. Thanks for the great post. Very yummy. If you need info on all natural granola then check out these guys.